You could possibly get your Michigan black bear before season even opens, and it would all be legal. Starting this year the DNR will have the option to issue bear damage shooting permits for bears causing agricultural, horticultural, or apiary (beehive) damage. Any area open to bear hunting could see a potential for an early permit. Even as early as July 1st. Gov. Rich Snyder signed Public Act 407 in December of 2014. The act allows hunters who were successful in drawing a bear license to use that license on property on which the owner has a bear damage permit allowing the shooting of a nuisance bear. Nuisance bears may be harvested only for the area that your permit was drawn in. The permit is only valid for one bear a year old and may not be used for cubs or females with cubs. Hunters will not be allowed to use bait or hounds in pursuit of a bear using a bear damage permit. Bears will feed on corn, oats, apples, cherries, and beehives! Hunters harvesting a bear using this permit would have 72 hours to register the bruin. Any hunter with a bear permit is asked to contact their local DNR wildlife biologist and let them know you are willing to use your tag on a bear nuisance permit. Kevin Swanson is the DNR Bear program leader, and he can be contacted at the DNR’s Marquette office. Swanson will then make a list of potential hunters, and once a permit is issued, will notify those on the list. He can be reached at (906)-226-1357 or at swansonk@michigan.gov. No more than 5% of permits will be issued in any Bear Management Unit for problem bears. The Department of Natural Resources today announced the final totals from its spring fish-stocking efforts. DNR fisheries staff stocked a total of 20,099,988 fish that weighed more than 325 tons and consisted of nine different species and one hybrid. 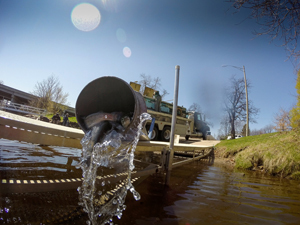 The DNR maintains a public database of fish-stocking records, which can be reviewed atmichigandnr.com/fishstock. Cedar Valley Golf Club – A Jewel In The Woods! Several years ago my brother Randy and I stumbled onto the Cedar Valley Golf Course in Comins Michigan. We really liked the course layout, but it was in a gradual decline, as the owners were trying to sell it. We always got in several rounds of golf whenever we stayed at my place in Luzerne. Even though we had several courses closer we would choose to drive a few extra miles to play Cedar Valley. The operation folded and Cedar Valley reverted back to the wilds, as no buyers were to be found. It was a shame the last time we took a drive by the place, to see the overgrown fairways as nature took over! Well in 2014 new ownership and management took charge, and big changes started to take place. Current owners John and Carole Kulhavi plan to keep on making various improvements, and the management addition of Mike and Rebecca Harrington play a major role in overseeing those improvements. Several new additions related to a “Fun Park” theme (putt-putt, batting cages, and carnival rides) are part of the family atmosphere the Kulhavi’s want to create in the very near future. I can tell you from my first hand experience that this “little jewel of the north” is back and in the best condition it’s ever been in. Mike and Rebecca, and family, have put their heart and soul into improving the grounds, and from my perspective “hit a home run!” My golf partner and I played the course twice a few weeks ago, and our only regret is that we ran out of time to play a few more rounds. Years ago when I played it was $37.00 a round for a senior with a cart. Prices are now $25.00 dollars for 18 holes with a 10% discount for military veterans. Several other discounts for groups are available with a special Tuesday golf package consisting of a dollar a hole, a dollar a hot dog, and a dollar a beer. Sunday scramble events are starting to draw more golfers, and it won’t be long till this “cat” is out of the bag. If you live in the Mio, Fairview, Lewiston and Comins area, or have a summer place near by, you have to pay a visit to Cedar Valley. Friendly staff, beautiful grounds, and challenging greens await those who want to experience for themselves “The Jewel In The Woods!” I promise you will not be disappointed. Everyone who enjoys Michigan’s waters has a role to play to assist in protecting against AIS. Here are a few simple things you can do! If you equip yourself with the knowledge to properly identify AIS you can help the DNR discover threats. 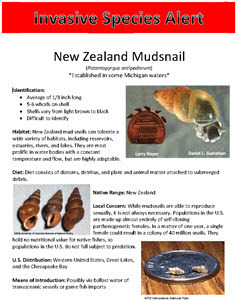 Check out newInvasive Species Alert documents from the DNR’s Fisheries Division that provide the following information on numerous species: identification characteristics, habitat, diet, native range, why they are of a local concern, how they may be introduced, and how you can tell them apart from native species. If you think you’ve found an invasive species – whether you discover it while you’re fishing, purchasing bait, or just out for a stroll on your favorite shoreline – the next step is to report it to the DNR! Check out the department’s Invasive Species Reporting in Michigan website for ways to do this. There are many simple steps you can take to ensure you don’t accidentally introduce a new invasive species into Michigan’s waters or spread an already established invasive species even more. One of the easiest ones is: Clean, Drain, Dry, Dispose! Clean – remove aquatic plants from boats, boating equipment and boat trailers before launching or placing in the water. Drain – empty live wells, bilges and all water from boats before leaving an access site. Dry – your boats and equipment for at least 5 days before launching into a different body of water. Dispose – put your unused bait in the trash. Do not release bait into the water. So far this has been a banner year for the Ansel gang hauling in the fish! Had another successful day yesterday at our secret “glory hole,” as the grandkids and I had a blast. I landed my fourteenth (14th) bass of the year and to top even that, my 6-year-old grandson landed a 19 inch largemouth all by his self! It was a classic (was ment to be) catch, as he was fishing for sunfish with a small hook and part of a worm. When the bass pulled his bobber under he yanked the pole and set the hook. We all thought he had a big sunfish, until the bass broke water shaking its head trying to throw the hook. We all about “crapped” our pants, but not Brady. He gave the pole two cranks then threw it down in the sand and started hand reeling. We’re trying to get him back on the pole, but he would have none of it! He hand reeled that “bad boy” right up onto the beach and had one bragging fish flopping around. When I picked it up to get some pictures the little hook just “popped” out of his mouth. Brady couldn’t even hold the “monster it was wiggling so much so his fishing buddy (dad) held it for him. It was neat to see Brady release the fish as it swam off to safety! What a fun-filled week we just spent at the cabin. We swam, spent time at the Traverse City Cherry Festival, did the zip line, fished, played cards (games,) and had some good eating. One of those days we caught 10 rainbow trout ranging in size from 10-16 inches. I decided to try a new recipe I had for cooking fish on the grill. Most of our gang had left for home and only our good friends Ed and Linda remained with us. Neither Ed or Linda have had good experiences from eating trout, and I was hoping this meal would change their minds. I used two of the bigger trout for our dinner. I’m about to reveal my recipe which can be custom fit to your own taste and desires. After rinsing the fish off I opened up the cavity and put salt, pepper, a dash of garlic, and any other (parsley) condiments to enhance flavor. I then put a tablespoon of butter inside along with slices of lemon. You can also use lemon juice. I then poured about 2 tablespoons of Italian salad dressing on the fish and placed cut up lemon and onion on the outside. I used the non-sticking aluminum foil to wrap them tightly in and put them on the grill for about 30-40 minutes. I turned them over one time while cooking, and I must say they turned out great. Pulling on the backbone removed the rib bones and smaller bones, but you still have to check for the few that might remain! Ed, Lorna, and Myself all enjoyed the firm white meat with Lina even eating a couple of sample bites. I’m going to try it again at home and maybe add broccoli and cauliflower to the tin foil package. Been awhile since I blogged as we are vacationing at the cabin. Just relaxing with the family as we do all the things one can do in the north woods. Canoeing, 4- wheeling, fishing, and swimming to name a few. Oh I can’t forget eating. We are all off our diets for sure. seen a hen turkey with 12 little ones and two does when I get homewith fawns. Some went into Traverse City for the Cherry Festival. Saw the blue Angels and ate lots of cherry pie. I will post pictures and catch up on my blogging when I get home.